A gift from mom and dad has Alicia and Lorenzo painted on the top of the box in their tropical setting. Around the side, the wonderful honeymoon. Inside, a personal inscription from mom and dad. The pastry chef and the fireman dance while hot flames of love and their favorite food surround them. Details of their honeymoon in Aruba make the sides shine with memories. Open the lid to find a quote requested by the bride. 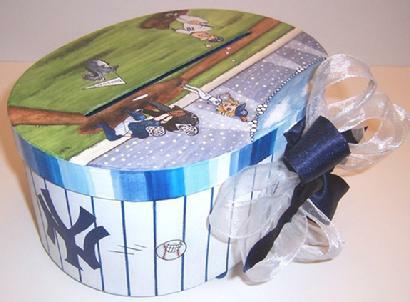 New York Yankees baseball fans all the way! Dana steps up to bat while Dino's heart flutters at the site of her. 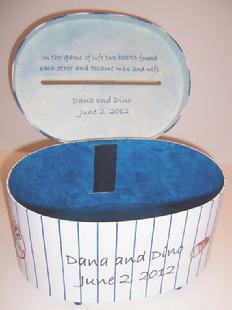 The Yankee pin stripes, logo, baseballs and their names and wedding date celebrate the day. 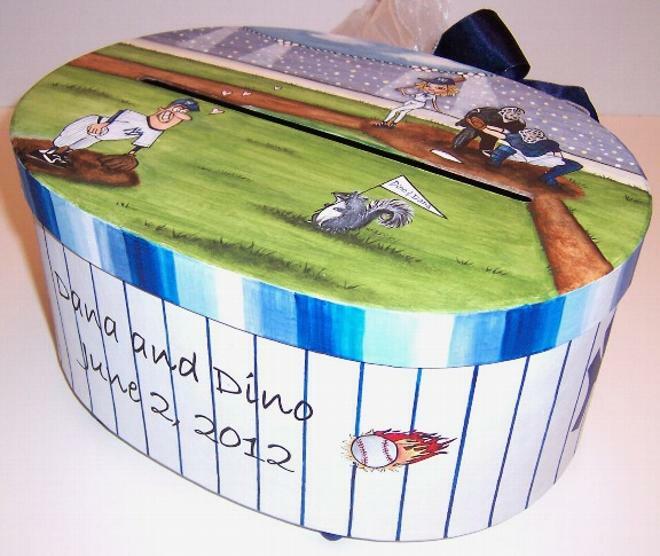 Inside, a baseball quote that the bride requested. Here are examples of personalized wedding gifts for that special bride and groom. You choose the style, colors and theme -- how they met, the engagement, the wedding or even the honeymoon. 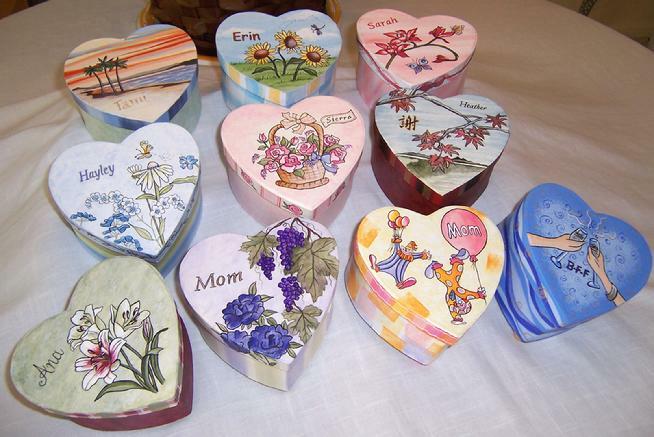 Add their names, the wedding date and a personalized message inside and your gift becomes a lasting memory. Wood Wine Box - True Love is the Greatest Adventure! Wood Wine Box -and so the Adventure begins! Wedding Memory Box - A portrait of Barbara and Dave on top of their personalized memory box. Wedding Memory Box - Barbara and Dave and memories of their honeymoon on Catalina Island. Champagne Glasses - For the bride and groom. Wood Wine Box - A Canadian couple celebrates 25 years together with my take on a classic Cezanne painting. Wood Wine Box - A heartfelt inscription from their Best Man, hand painted in French. 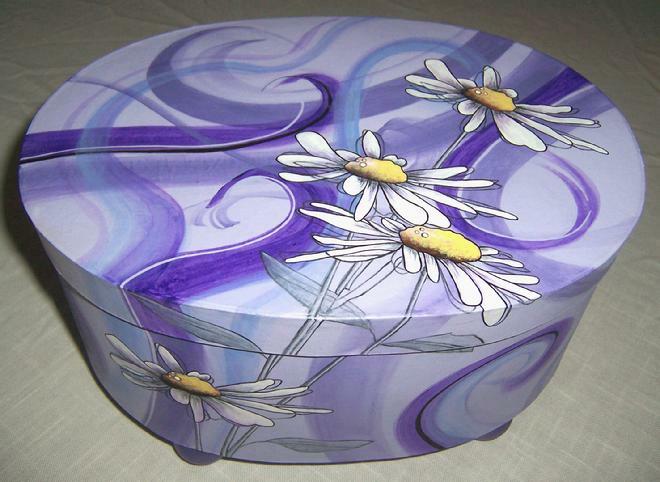 Wedding Memory Box - Painted in a modern style with the wedding colors and flowers. Wedding Memory Box - A special order for a wood box painted in a nautical theme with the Bride and Groom on top. Wedding Memory Box - The nautical theme continues around the sides. Wedding Memory Box -Catherine and Ronald, a wedding to remember. Wedding Memory Box - Robin and Ethan married at the Seafarer's Memorial in Alaska with their pets attending. Wedding Memory Box - A special inscription from Mom and Dad. Wedding Card Box - Or, Honeymoon Fund Box. 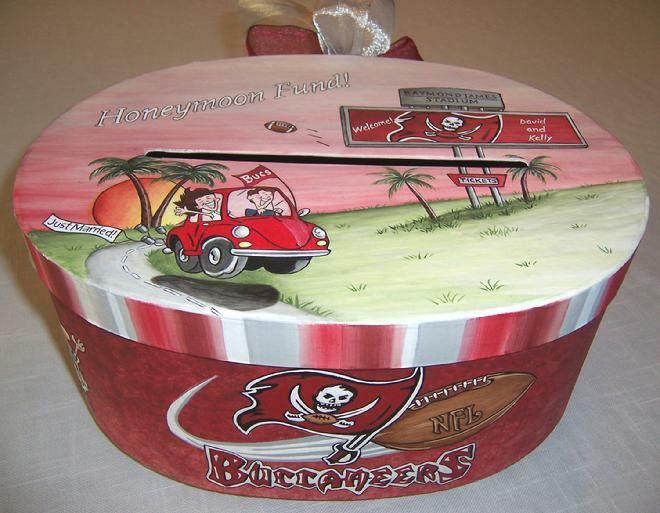 The wedding guests stuffed this cool box with lots of cash so the happy couple could spend their honeymoon at the 50-yard line. 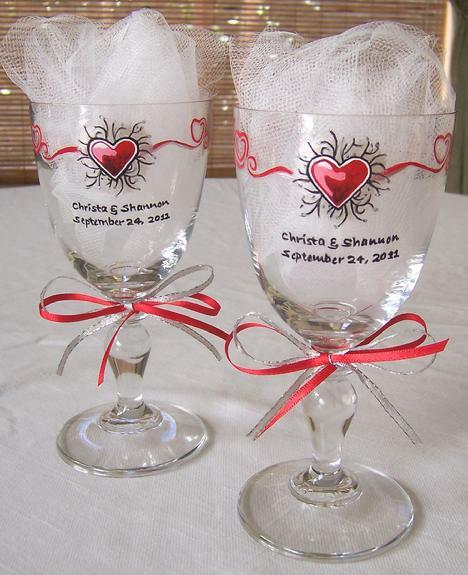 Wine Glasses - Personalized for the Bride and Groom with their names and wedding date. Wedding Memory Box & Wine Glasses - An 8-inch heart-shaped mache keepsake box and matching wine glasses evoke memories of a classic Pink Wedding. The perfect place for the Bride to store her cherished items from a special day. Wood Wine Box - The perfect wedding gift to celebrate a honeymoon in Italy. Wood Wine Box - The Napa Valley wood wine box celebrates a lazy afternoon, complete with grape leaves and a rolling vineyard. 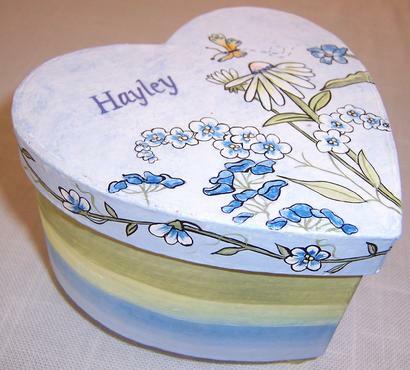 Wedding Memory Box - A heart-shaped mache box is for the Maid of Honor with her name on top. 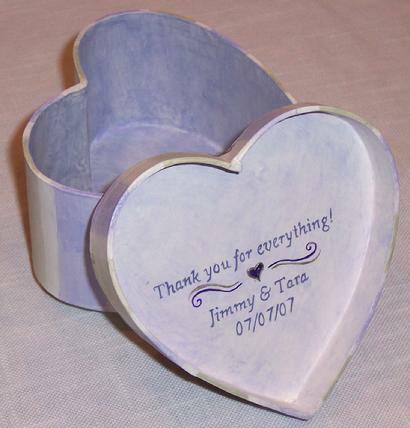 Wedding Memory Box - Personalized from the Bride, this is one wedding party gift that will ensure loving memories. Wedding Memory Boxes - A gift for each of the Bridesmaids, personalized and given with love by the beaming bride. 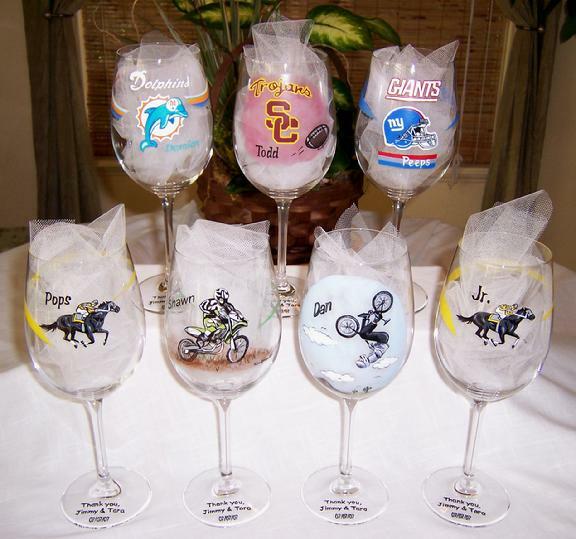 Wine Glasses - Each of these Groomsmen wine glass gifts are personalized with his name, favorite passtime and the wedding date. Could these be any cooler? Wedding Memory Box - Don't forget Mom when planning gifts for the wedding party! 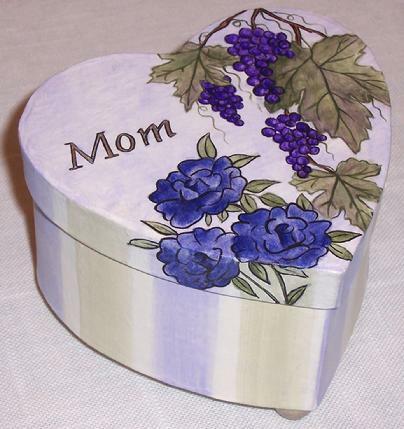 What Mom wouldn't love to receive this lovely heart-shaped gift box? 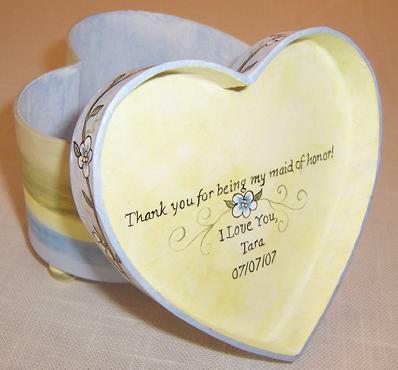 Wedding Memory Box - A message of loving embrace inside. Wedding Card Box & Champagne Flutes - A 'Wedding Set' covers all the bases, matching the wedding invitation, color and theme. The set includes Bride & Groom champagne flutes, party favour boxes, votive candle holders, flower vase and a wedding gift card box. Wedding Card Box - Sits proudly at the reception sign-in table, accepting all the gift cards and money that could be stuffed inside! 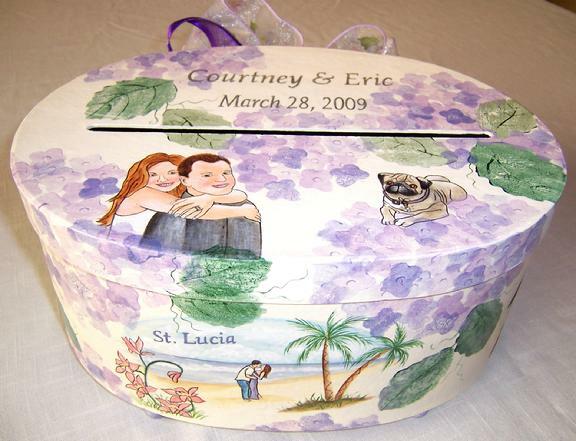 Decoration included a matching color scheme and ribbon, their beloved pug dog and images of their beachside honeymoon. 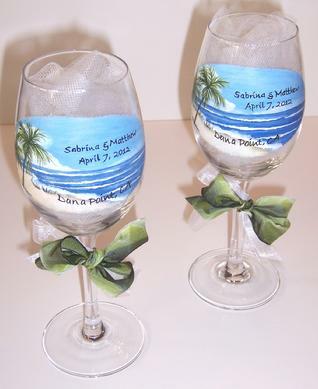 Wine Glasses - For the Bride and Groom.